In my house, we love Thanksgiving leftovers even more than Thanksgiving dinner. Inevitably, we always have one item that’s disproportionately left over—if that item for you this year is stuffing, this Stuffing Burgers recipe is great between slices of bread with lettuce, cheese and tomatoes. Or, try sans bread with a dollop of tangy Cranberry Sauce! 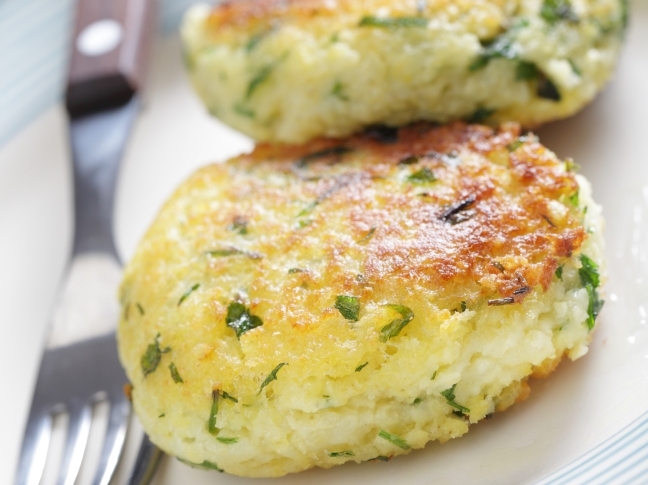 Either way, they’re almost like a vegetarian crab cake of sorts—and they’re super delicious. Step 1: In a medium-sized mixing bowl, combine the stuffing with the egg, cornmeal, and scallion. Mix well. Step 2: Use your hands to shape the "burgers," making 6 patties from the mixture (about 1/2 cup each) and place the patties on a plate. Season with a bit of salt and pepper. Step 3: Over medium-high heat, coat a large saute pan with olive oil. Once the oil is hot, place the "burgers" in the pan (you should hear a sizzling sound if the pan is ready). Cook until the bottom is nicely browned, about two minutes. Flip, and brown the other side. Sweet Potato and Apple Mash RecipeA Christmas Cake, My Slow Cooker Did Make!